Ultimate Beaver Builder Addons Review - Is It Good or Bad? 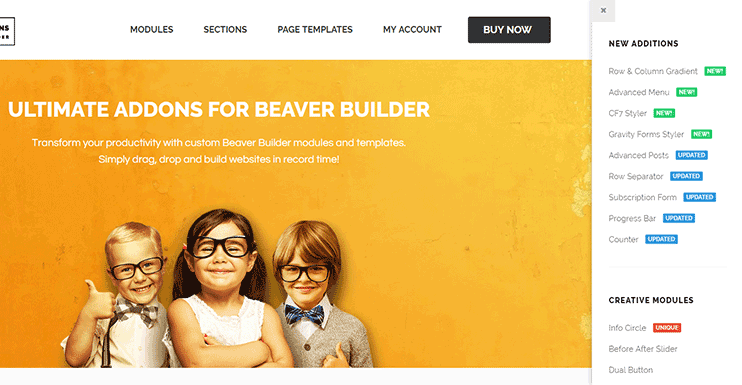 Beaver builder is one of the most popular page builders that you can use with WordPress. The beaver builder allows page building with the drag and drop options. No need to care about the code or the CSS files. Everything can be managed by moving the reusable content modules. The Ultimate beaver builder add-ons – as the name suggests, are the beaver builder extensions developed by the Brainstorm force. It is available as a plugin that you can install through your WordPress dashboard just like any other WordPress plugin. The only pre-requisite for using this plugin is the Beaver builder plugin, installed and active. So if you are using Beaver builder page building tool (or thinking to go for it), and looking for some cool extensions/pre-built modules & templates, you should definitely read this. Because in this article, we’ll see what the ultimate add-ons for beaver builder have to offer. We recommend Ultimate Beaver Builder Add-Ons. You can’t go wrong with this massively popular software. Grab Beaver Ultimate Builder Add-Ons today! and get started with your WordPress site. 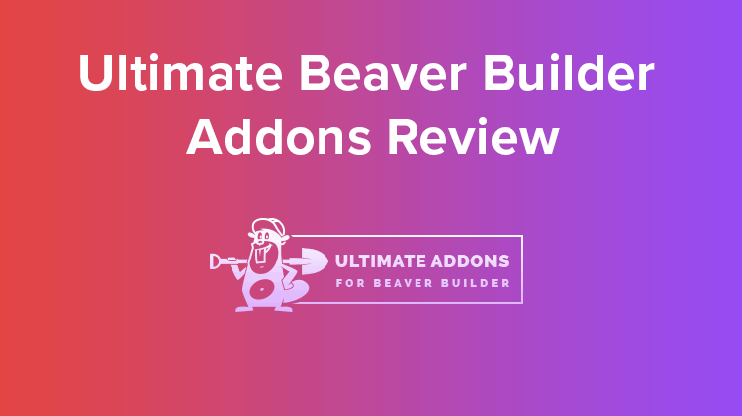 Like most of the software, there’s a lite (FREE) version of the Ultimate addons for beaver builder. This free version is like a trial version but it comes with many useful modules. If your requirements are moderate, there are enough options for you in the lite version itself. However, if you need more options, I suggest going with the pro version of the Ultimate addons for beaver builder. The pro version has much more to offer. It comes with more than 100 pre-designed and ready to use page templates, custom modules, and 200+ row designs. 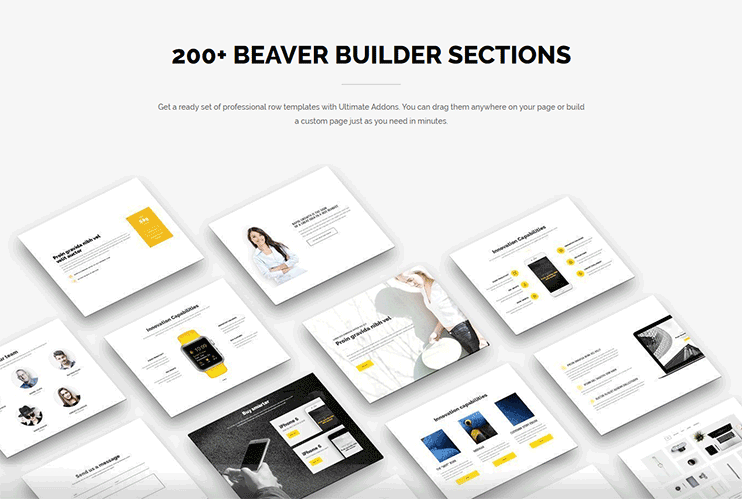 Beaver builder is a page building tool that allows you to control everything with drag and drop. And the ultimate beaver builder add-ons are designed to add more utility based modules into the beaver builder plugin. The ultimate add-ons for beaver builder come with some more page templates, section designs, and custom modules. You can use all these elements to create a professional and beautiful design without touching a line of code. 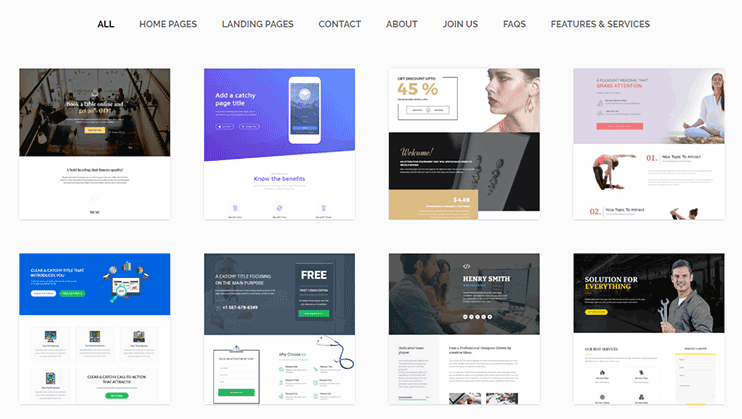 The Ultimate Beaver builder add-ons come with pre-designed page templates that you can directly insert into your website and start using right away. For each of the page mentioned above, there are multiple templates you can choose from. The templates are flexible and you can use them for any purpose of your choice. For instance – You can take the About Us page and use it to describe a department of your institute. Or, you can use the landing page template to create a sales page for your software. You can get creative with these templates as all of them are designed logically to focus on conversions. 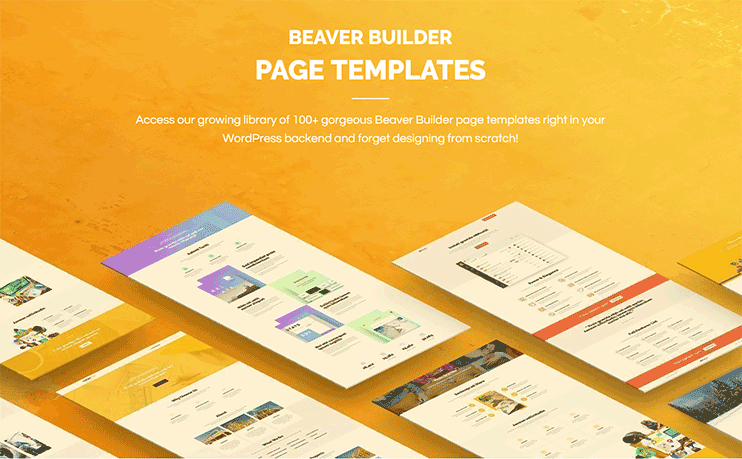 Currently, the page templates library of the ultimate beaver builder comes with more than 100 templates for different niches. All of the templates are stored on the cloud, so you can only install and use the one that you want. However, the available page templates are not a limit. They actively update their modules and so you can expect page templates in the future. We’ve talked about the pre-designed page templates in the last section. But what if you don’t want to use the entire page. What if you don’t want to change the entire page design but only need to make a minor change? For this, you can use the custom modules. These modules can be placed anywhere on your page. The custom modules are in form of the row separator, menu, forms, etc. These modules are pre-designed as well as pre-programmed to perform their tasks. For instance- There are ready to integrate hero sections to show banners. If you want to show images, you can use the gallery module. Or you can use the content module to enter formatted content anywhere into your website. Moreover, the sections are customizable to fit your website’s styling. Again, if you don’t want to go for complete page template design, you can opt for pre-designed sections. These sections are in fact rows, that you can integrate into the desired place into your website. Ultimate addons for beaver builder lets you choose from more than 200 section designs. Each sections are designed professionally and pre-programmed. Some of these sections have beautiful animations too. Even if you are well-versed with programming and designing, creating such sections takes time and intense efforts. But with this plugin, it takes just minutes to include attractive sections in your website. Just choose the one that fits best, and drop it wherever you want. 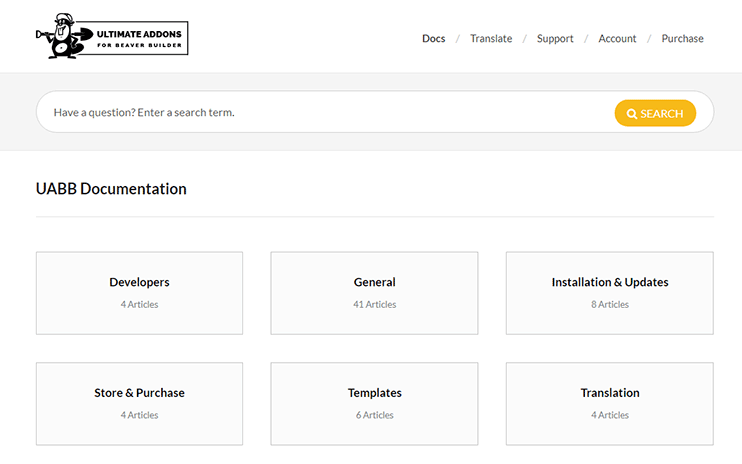 Again, like the custom page templates and modules, these sections are thoroughly customizable. You can change them to complement the design/theme of your site. You can use beaver builder tool to create a website with any theme. And this means that you won’t have to buy a specific theme to make it work. You just start with whatever theme you have. If you have beaver builder installed and running successfully, then ultimate beaver builder promises to integrate smoothly into your site. Though it works best with the beaver builder theme, genesis framework, and generatepress. Developed with the best WordPress standard, the ultimate add-ons for beaver builder is totally SEO friendly as well as lightweight. They’ve followed the best practices to make sure that the plugin is as light as possible. Generally, if you use unprofessionally designed plugins, they may slow down your entire system. But that won’t happen when using the Ultimate addons for beaver builder. Moreover, the extensions integrate seamlessly with your WordPress website, without conflicting with any of the existing software you are using. Ultimate beaver builder add-ons provide their product as white label software. Meaning, you can re-brand it after purchase. So if you are a freelance programmer, or a web development agency, you can rebrand every element before you hand over your project to your clients. When in doubts, you can search their knowledge base. Additionally, they have a lot of videos that can guide you while you are setting up your website with their plugin. In case, you don’t find your answer in the knowledge base or the videos, you can directly raise a query using the support form. The expert team at brainstorm will get in touch with you and help you out. You can try the UABB lite version at first. But for more modules and more designs, you can buy the pro plugin at an affordable price of $69. You can choose from the two pricing options displayed below. You can opt for a one year license or a lifetime license. What is best, is that you can use this plugin on as many sites as you want. 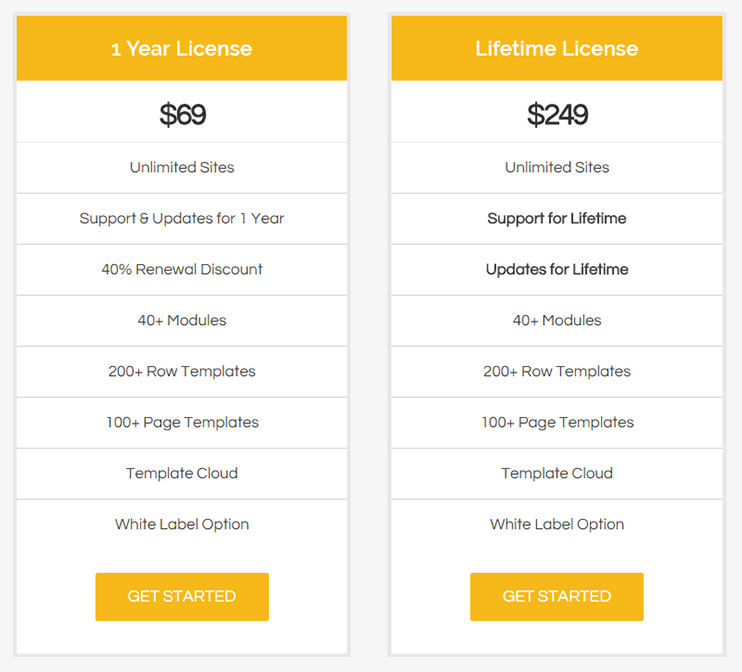 As much as the Ultimate addons for Beaver builder is flexible, so is their pricing policy. If within 14 days of purchase you find that their plugin not suitable for your purpose or your website, you can demand a refund. Their 14-day money back guarantee makes sure that you don’t regret the purchase in case you are not happy with their product. Ultimate beaver builder add-ons are actively updated for bug fixes as well as new features. You can update this plugin right through your WordPress dashboard. The features by Ultimate beaver builder addons provide you with all the options to make your website look and work the way you want, without tweaking a line of code. Moreover, it saves time and efforts. 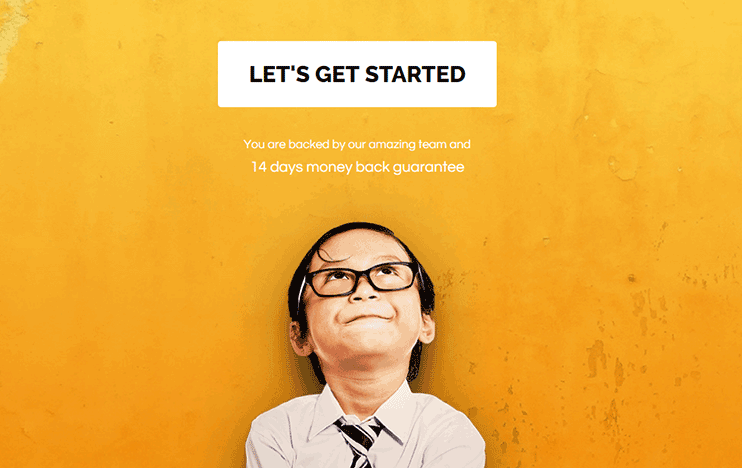 So, if you want to create a WordPress website with attractive and professional design quick and easy, using the free Beaver builder along with the Ultimate addons for beaver builder is recommended. We recommend Ultimate Beaver Builder Add-Ons for your WordPress site. You can’t go wrong with this massively popular software. Grab Beaver Ultimate Builder Add-Ons today! and get started with your WordPress site.